A smart TV device is either a television set with integrated Internet capabilities or a set-top box (STB) for television that offers more advanced computing ability and connectivity than a contemporary basic television set. Video is the main function for smart TV users. At present, game apps development are not so active as video ones. It is still unclear about how to pay for paid game apps. It is hard to integrate different kinds of hardware (Television, STB). Since smart STB is a new product, it still needs to be improved. There is limitation when a large game is running. 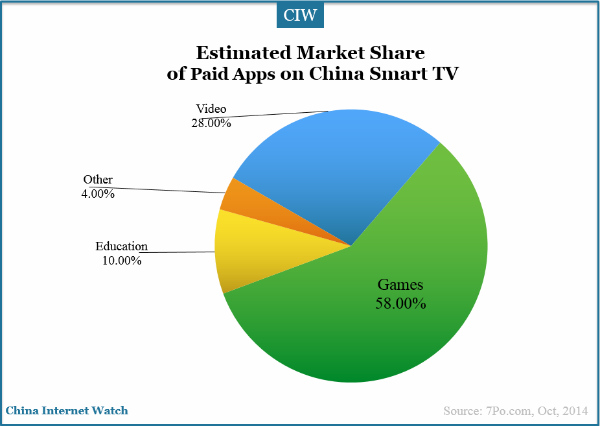 Compared with H2 2013, downloads of video apps on China smart TV decreased by 11.1%. With increase of smart TV users in the future, game developers are going to devote into more smart TV game apps. It is estimated that downloads will increase to 30% in 2 years. In H1 2014, Downloads of education apps incresed by 1.3% from H2 2013. Online education market is on its early stage and its development on desktop and mobile device is not so popluar in China. Smart TV has its own advantage, big screen, large room in sitting room, so it is estimated education apps downloads will increase to 10%. Video apps accounts for 55% in future smart TV apps, which shows they will still have great potential in smart TV app market. With video sites’ standardization and operators’ enhanced awareness about copyright, paid video app is gradually accepted by users. 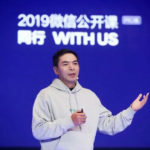 As post-80s in China are concerned about educating their children, in the future, parents are willing to pay expenditure on education. Games, education and video apps are top 3 ones, accounting for 75.1%. 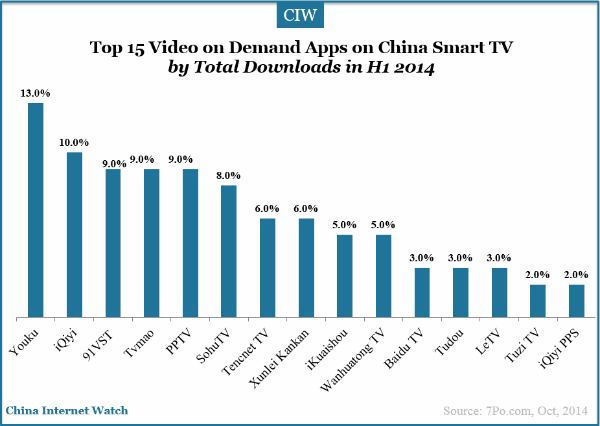 Youku, iQiyi and 91VST were top three video on demand apps on China smart TV by total downloads in H1 2014. In H1 2014, Togic ranked top among live TV video apps on China smart TV by total downloads, followed by Kantv and TVapk.